Some call me cheap others call me a penny-pincher. What ever name they throw on me, well that's OK. Because I am proud to be a cheap, frugal, penny pinching mama. Today I want to share two easy frugal breakfast mixes you can make at home. Sure you can buy them at the store, but they are so expensive. Why not just make them at home for next to nothing. The first breakfast mix you can make is Instant Oatmeal. You know the oatmeal that comes in a box with individual packets inside. Don't worry I to am guilty of buying them myself, but no more. You see my daughter Mackenzie loves instant oatmeal. She can eat oatmeal for breakfast, lunch or snack time. So we can go through those instant packets rather quickly. It seemed like every time I was in the store I was buying another box. Well one day when I was scanning through a Family Circle magazine. And way at the bottom of the page I saw a article that caught my eye "penny-pinching breakfast". Well you can guess what I got up and did............. I made the oatmeal mix. The next morning I tried out the oatmeal on my daughter. I showed her how to measure the mix, add water and cook it in the microwave. Mackenzie said it tasted just like the brown sugar and cinnamon oatmeal I had been buying in the store. She even went as far as telling me she liked the homemade mix better. I am so glad because I can get a ton more oatmeal with this recipe then with those little packets they sell at the store. I store the instant oatmeal in one of those big ice cream tubs you get at the grocery store. I usually double the recipe so the big ice cream tubs are perfect. Then I leave a 1/2 cup measure in the container so Mackenzie can prepare it all by herself. She knows that it is 1/2 cup oatmeal to 1/2 cup water so its easy for her to remember. Plus I have it written on the top of the cover. 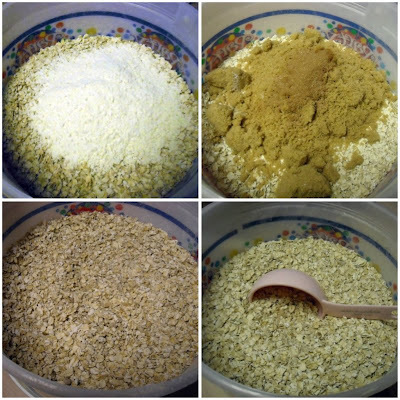 I have included some photos of how easy it is to make this instant oatmeal mix yourself. scoop 1/2 cup oatmeal into a bowl and mix with 1/2 cup water. You may need a bit more water if you like you oatmeal thinner. Microwave on high for 1 minute stir and enjoy. OK now lets move onto mix number two. Quick & Easy Pancake Mix. I know what you're thinking you love your pancake recipe so why make a instant one. Well, I love my Favorite Pancakes as well, but this mix comes in handy for school mornings or when you need a quick hot breakfast. I found out just how handy this mix was one day when the kiddos wanted pancakes for breakfast. I didn't have cake flour so I couldn't make our favorite pancake recipe. Well the kiddos still wanted pancakes and then it dawned on me. I had a container of the quick & easy pancake mix in the pantry. Now we could still make pancakes YEAH!!! This pancake mix makes really good pancakes and it's perfect for when you're in a pinch or short on time. Again this easy homemade mix can be made easily with items you have on hand. Now don't go and give up your favorite pancake recipe, but if you need a back up this one will sure to please. I have included the recipe below for the quick and easy pancake mix so you can make right at home. Enjoy!!!! Mix all the dry ingredients together. Place pancake mix in a air tight container. Don't forget to add a label with directions on how to prepare the pancake mix. Combine all ingredients; blend well. Place in a large container or divide by 2-cup amounts into plastic zipping bags. Store in a cool, dry place for up to 8 months. Attach instructions. Makes 12 cups. * I cut the recipe in half and made a half batch. Combine 2 cups mix, one beaten egg and 1-1/4 cups water, milk or buttermilk. Mix just until moistened; drop by 1/4 cupfuls onto a hot, greased griddle or skillet. Turn when bubbles form on the surface; heat until golden. Makes 12 to 14 pancakes. Great idea for homemade oatmeal "packets"! I, too, have already downloaded the mac and cheese recipes- can't wait for more!! Hi Stacia, Gooseberry Patch Rocks!!! I love their site and their cookbooks. It feels like H♥ME. Thanks! I will be making these up for sure. I too am a penny pincher and proud of it :) I try to keep as much of our food as I can homemade, but I'd never thought about making up an oatmeal mix before. Now that you've put the idea in my head, though, I'm going to have to give this recipe a try! We are big breakfast eaters at our house and we like our oatmeal too. I am also guilty of buying the instant kind but only use it once in a while. I love this recipe! I'll never have to buy instant again. I love Gooseberry too, guess because I'm basically just a simple country cook and that's the kind of recipes that they have. Those are both awesome mixes to keep on hand! 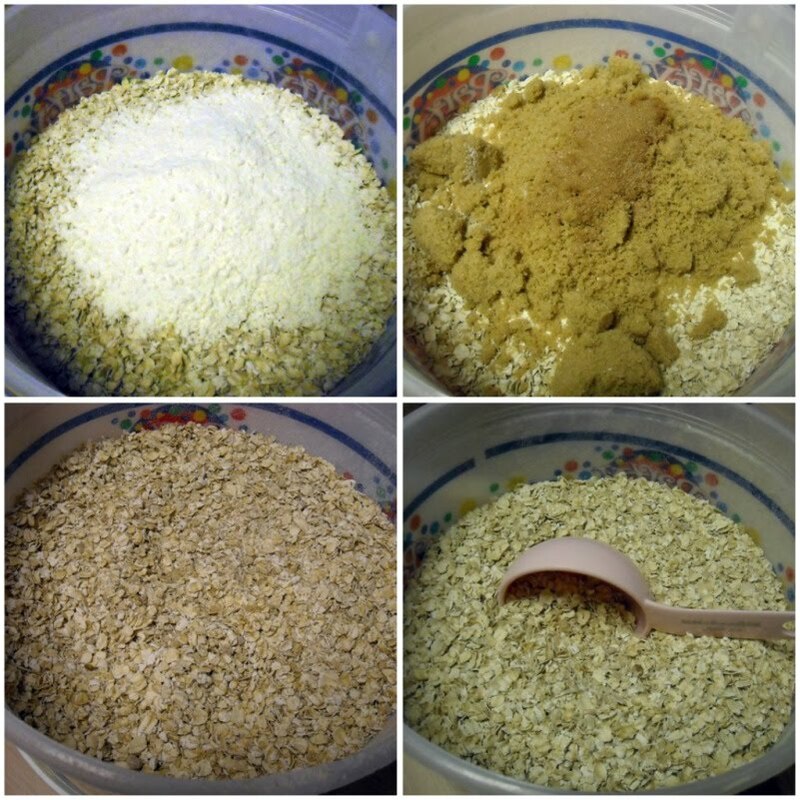 I had used a similar homemade "instant" oatmeal for years when I had more mouths at home to feed - it's great for when you have little ones at home and SO much better for you than the prepacked stuff. These days with just The Cajun and me - I'm the only oatmeal consumer (silly man!) so I just use regular Quaker oats a bowl at a time, and I do pancakes as I need them. Hope you're having a great week!! Are you going to enter anything in the RO*TEL contest? LOVE that instant oatmeal make-at-home mix...what a great idea! I definitely need to make that pancake mix! I worked at a biological field station for half a year and I made pancakes from scratch all of the time. I never thought to make up a big batch of dry mix. I guess I have a plan for the weekend now! I mix up my morning oatmeal each morning and have been thinking how it would be such a timesaver to make a big container of the mix like this... I was worried about the ingredients settling/seperating. But now that we are getting warmer in MN and its 65 when I'm having breakfast, I feel like it is keeping me warm all day!! I'm suprised you guys enjoy oatmeal in the warm months down there!! Jenny my daughter can eat oatmeal on a 100 degree day. She loves it that much. The ingredients dont really settle at the bottoma at all. I always give it a big shake before i open it up. I think it would be great with dried apples and raisins. Yum we eat crockpot oatmeal no matter what season we love it. I will have to try your recipe as well. Fabulous! My oldest can easily eat three of those oatmeal packets per sitting. Even when buying the store brand I feel like I'm wasting $$$. We'll be adding this one to our morning routine for sure! I love having pre-measured instant oatmeal in my pantry. The kids love to make it all by themselves before school. Thanks! Also, ust thought I would let you and your readers know we are giving away a FREE Bosch Mixer (over $300) on our blog this month! Visit our blog for more details www.dealstomeals.blogspot.com to see how easy it is to win! Thank you for this recipe. I wonder if you could use 1/2 wheat flour? My daughter loves pancakes and waffles so this would come in handy. I also like the looks of the rolls in the previous post. Yummy!! Hi! I, too, find myself buying a box of expensive oatmeal every time I go to the grocery store. Lately, we've been buying organic instant oatmeal which uses steel cut oats. Do you know if I could substitute steel cut? Love looking at your site! That's awesome! I'm so gonna make the oatmeal. I reuse my ice cream tubs too. I mix up salad in it. :) The first time I pulled it out the kids were so excited for the ice cream. Now it's a running joke in our house.